A team of researchers in Switzerland have developed a way of levitating and transporting small objects using nothing but sound. Using ultrasonic waves that is, sound waves whose frequencies are too high for humans to hear, scientists at the Swiss Federal Institute of Technology in Zurich have made water droplets, instant coffee crystals, styrofoam flakes, and a toothpick, among other objects, hang in mid air, move along a plane, and interact with each other. 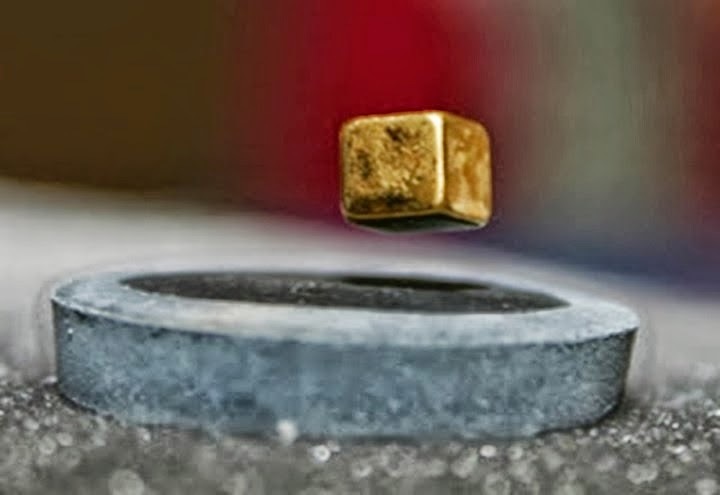 It is the first time that scientists have been able to use sound to simultaneously levitate several objects next to each other and move them around. As anyone with a subwoofer and a teenager knows, sound waves exert pressure. When those waves are bounced between carefully aligned surfaces, they can create what is known as a standing wave, in which the total pressure from the original wave and its reflection cancel each other out. Objects placed at spots along the wave with the lowest amplitude, known as node points, tend to stay put. In the past, scientists have been able to acoustically levitate bits of styrofoam and even small insects and fish. But until now, nobody has figured out how to get acoustically levitated objects to do anything other than just hang there, even though moving them has long been known to be theoretically possible.